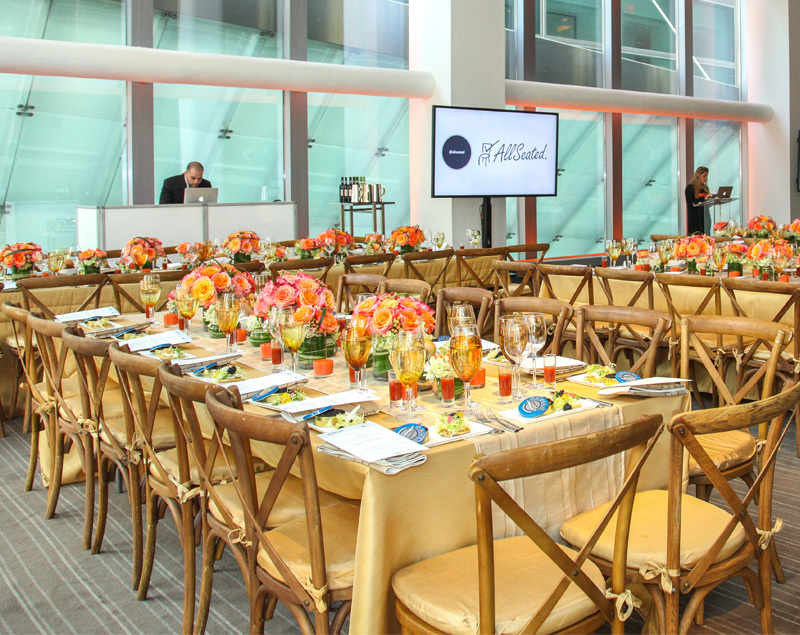 When it comes to planning an event at a venue, one of the most important things to consider is how to make use of the venue space. While the venue itself can’t change, the way you use the venue space can. From bar placement to table arrangements, get creative and use the area in a fun and unique way. Let’s take a look at some ways to see the venue space in a new light. Remember, just because you’ve seen pictures of the way previous clients arranged the venue space doesn’t mean you have to follow suit. Have an open mind when you walk in, and start from scratch. Think about the tone and feel you are looking for as you ask yourself a few questions. Is the venue space the right size as is? Does it need to be made smaller? Alternatively, does the space feel a little on the small side? Think about really utilizing some of the often forgotten areas like corners, hallways and alcoves. They may even turn out to be your favorite spots! Mapping out the look and logistics of the event is the perfect time to collaborate with your vendor team. Invite all vendors into the AllSeated account for the event so that they can see the venue space and floorplan. Using AllSeated’s floorplan tools, your team can help to design the event’s floorplan to-scale while providing furniture placement ideas. Make use of the AllSeated’s vast furniture libraries to get creative within the venue space! Since all data is updated in real time, it’s easy to work together within AllSeated to create the vision for the floorplan of the venue space. At any time during the process, easily switch from 2D to 3D to take a virtual walkthrough of the venue space to get a real feel for the event without needing to be there in person! AllSeated’s Virtual Reality is now available too! By using our special virtual reality goggles, you will be able to tour your venue space layout in a realistic simulation. Learn more about AllSeated’s Virtual Reality and the three easy steps for getting started here. Every venue comes with its own unique challenges, so coming up with creative solutions to make the perfect layout is key. For example, drapery can create a dramatic effect while also covering areas you want hidden, while a beautiful greenery or flower wall can act as an ideal photo op, but also a partition that separates spaces. Is your venue too big? Consider breaking the room up into distinct areas that will create natural flow throughout. For example, one area could have food stations while the other is for dancing. All of these details can be specified on your floorplan diagram which helps to create a seamless set-up of the venue space on the day of the event. The possibilities are endless when it comes to the layout of a venue space, so let your imagination run wild. Heather Jones is the Catering Sales Director for Wente Vineyards, a family-owned property that is home to a winery and vineyards, a golf course, restaurant, and a handful of unique facilities for hosting weddings and special events.